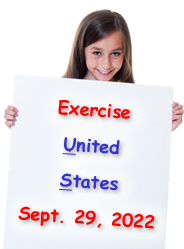 The Exercise US (Exercise United States) program will always take place in September in honor of National Childhood Obesity Awareness month. The eleventh annual Exercise US day will take place on September 26, 2019. Please visit the sign up page to get your school or organization involved. All times zones in the United States were considered when the program was created. You have the option of signing up for a 15 minute time slot that works best with your school or organization. The program will start at 8:00 a.m. eastern time, and end at 3:00 p.m. pacific time. Sign up for a time slot of your choice. The program last for 10 hours, which totals 40 different time slots (15 minutes each) for your school or organization to enroll. Go to the sign up page to register. There is no charge to participate. Len Saunders is now introducing his new books from his "An Adventure In Exercise" book series starring Joey the Kangaroo and Spunky the Monkey. Click here to visit the books home page, and to learn how you can receive a special discount on your purchase. The official date has been set regarding the eleventh annual Exercise US program which is now scheduled for September 26, 2019. Due to many requests, the event has been moved from October to September in honor on National Childhood Obesity Awareness month. Feedback from around the country has been outstanding, as the schools and organizations involved loved the concept. We hope that year ten of the event will be just as successful! Thank you to all schools and organizations involved in the Exercise US program during the first nine years, as your support made the program a big hit. If you are new to the program this year, read on to learn more. To register, simply click the 'sign up' link at the top of the page. Please check out our new testimonials page, where you can share your Exercise US stories, videos, or testimonials. Childhood obesity has been on the rise, as approximately 1/3 of the youth in the United States are now considered overweight. Many reliable media sources are stating this may be the first generation of children whose life expectancy could be lower than their parents'. According to The Washington Post (May 17, 2008), "The average 10-year-old girl weighed 77 pounds in 1963; today, 88. The 10-year-old boy weighed 74; today, 85." Sadly, physical education in the schools is being reduced, and recreation programs have taken serious financial cuts. Sedentary lifestyles among children seem to be peaking as technology is replacing exercise. Is there any hope on the horizon? According to The Associated Press and CBS, (May 27, 2008), "The percentage of American children who are overweight or obese appears to have leveled off after a 25-year increase, according to new figures that offer a glimmer of hope in an otherwise dismal battle." Now is the time to motivate our children about the importance of leading a healthy lifestyle and to lead the fight against childhood obesity. The Department of Health & Human Services offers The Physical Activity Guidelines for Americans on their web site which shows the importance of physical activity towards maintaining good health. In 1987, physical education teacher Len Saunders of New Jersey participated in the historic youth fitness exchange with the former Soviet Union. The Soviet children took the United States fitness test created by The President's Council on Physical Fitness and Sports (now named The President's Council on Fitness, Sports, and Nutrition). The children of the United States took the Soviet fitness test. At the time, experts were stating that the Soviet children were far superior to the American children when it came to being physically fit. By the completion of the test, 90% of Saunders' students passed the Soviet test, far exceeding the low expectations for the American children that was suggested by the national media. Since then, Saunders has successfully created dozens of children's health and fitness programs that have motivated millions of children to exercise which includes Project ACES and PACES Day. Now, in the next chapter, Saunders is going to introduce the Exercise US program. The concept behind the Exercise US program is to motivate children to become physically fit and healthy by making fitness fun. Children will enjoy the concept of participating in 10 continuous hours of fitness from coast to coast. Schools or organizations that sign up will partake in 15 minutes of exercise at their location. When their 15 minute time allotment is over, they have completed their portion of the program. At that moment, in a new location, the next exercise session will begin, which could potentially be in a different state. The program will begin at 8:00 a.m. eastern time, and finish at 3:00 p.m. pacific time. For example, at 8:00 a.m. (Eastern Time) during the first time slot of this program, schools on the east coast will start to exercise. These schools will exercise for 15 continuous minutes, ending at 8:15 a.m. Promptly at 8:15 a.m., new schools will begin to exercise until 8:30 a.m. Then at 8:30 a.m., more schools will start exercising and conclude at 8:45 a.m. This pattern will continue for 10 hours, finishing with schools on the US West coast at 3:00 p.m. (Pacific Time). In total, there 40 potential time slots that your school can sign up for during the 10 hours of the event. Please visit the sign up page to secure your spot in history. More than one school or organization may sign up for each time slot. This program can be done with your entire school population, or to make it simple, use one class. This program is a great way to highlight your school's physical education program or your organization's youth fitness program. If the Exercise US program proves to be successful, the next step will be to try and accomplish a similar program worldwide. The thought of 24 hours of continuous exercise is very exciting to think about! The program could start on the eastern coast of the United States and start traveling west hitting each time zone around the world. Is there interest in Canada.....click here. Len Saunders, the creator of the Exercise US program has just released his new book entitled, Keeping Kids Fit. Participants of the Exercise US program are entitled to a 50% discount on the book. Click here to order and get your discount. Children need to get at least 60 minutes of activity everyday. Whether it is playing sports, simple calisthenics, or going on a family walk, adults need to get their children up and moving. The American Heart Association (AHA), is now reporting that 25 million children and adolescents (age 2-19) in the United States are overweight or obese - that's nearly 1 in 3 American children. Teach children the value of leading a healthy lifestyle! The AHA also reports "Most obese children already have at least one other major risk factor for cardiovascular disease, such as high blood cholesterol, high triglycerides, high insulin or high blood pressure." Use the Exercise US program as a motivational tool to help your children start exercising on a daily basis! Participating is as easy as 1 - 2 - 3. Read the information on this web site. Go to the sign up page and pick a 15 minute time slot. Participate in your 15 minutes of fitness on "Exercise US" day. 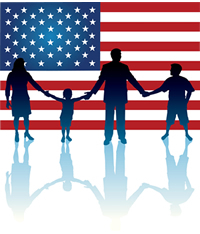 Why participate in the Exercise US event? According to The President's Council on Fitness, Sports, and Nutrition (PCFSN), "Moderate daily physical activity can reduce substantially the risk of developing or dying from cardiovascular disease, type 2 diabetes, and certain cancers, such as colon cancer. Daily physical activity helps to lower blood pressure and cholesterol, helps prevent or retard osteoporosis, and helps reduce obesity, symptoms of anxiety and depression, and symptoms of arthritis." The American College Of Sports Medicine (ACSM) recently sent out a press release that suggests "children and adolescents aged 6 to 17 engage in 60 minutes or more of physical activity each day, including aerobic, muscle-strengthening and bone-strengthening exercises." Promoting physical activity is the start of getting children healthier. The 15 minutes the children participate in the Exercise US program may not change their lives, but may be the start of a good habit that will help them lead a healthy lifestyle!